Coarctation of the aorta is often associated with hypoplasia of the aortic arch. A myriad of surgical techniques have been described to relieve arch hypoplasia at the time of coarctation repair.,, A true presubclavian coarctation of the aorta associated with diffuse aortic arch hypoplasia without any other intracardiac anomalies requiring surgical intervention is rarely encountered. This gives us the option of correcting the anomaly through thoracotomy without cardiopulmonary bypass. This subset is often associated with higher degree of recurrence if stenosis is not fully addressed. We have employed a modified technique in a similar situation which forms the basis of this report. A 30-day-old female child of 3.6 kg was referred to our institution as coarctation of the aorta. On echocardiography evaluation, the child had a borderline left ventricle, small aortic annulus (Z-score – 1.32), ascending aorta of 6.5 mm (Z-score – 1.15), borderline proximal aortic arch of 4.2 mm (Z-score – 4.04), hypoplastic distal aortic arch of 2.4 mm (Z-score – 5.58), and presubclavian coarctation of the aorta with a large patent ductus arteriosus supplying descending aorta [Figure 1]. Other than a small atrial septal defect, the child did not have any other intracardiac anomaly. After initial stabilization with prostaglandin, the child was taken up for surgery. A right radial and femoral arterial line was placed. A left lateral thoracotomy was done, and pleural cavity was entered through the third intercostal space. Hypoplastic transverse arch, proximal innominate artery, and left carotid and left subclavian arteries were mobilized extensively and the child was cooled to 33°C. 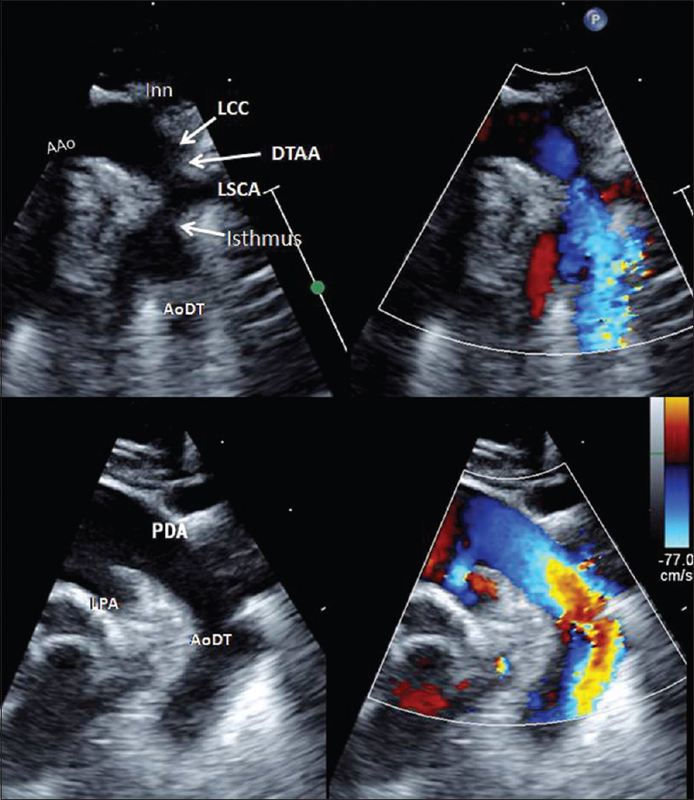 The descending aorta was also mobilized extensively safeguarding the intercostal vessels. The proximal aortic arch was found to be adequate only at the take-off of innominate artery after which it progressively narrowed indicating requirement for augmentation. A straight clamp was applied just below the left subclavian artery so that the patent ductus arteriosus perfuses the lower body which was confirmed by the femoral arterial line. The proximal aortic arch was clamped close to the innominate artery so that the innominate artery perfuses the brain which was monitored by the right radial artery tracing and by the pulse oximeter probe placed on the right ear lobe. A small bulldog was placed over the distal left carotid artery following which the left subclavian artery was ligated and divided distally. The proximal divided left subclavian artery was opened medially, and the incision was carried over the superior aspect of the hypoplastic transverse aorta across the coarctation segment and continued up into the lateral aspect of the proximal left carotid artery. The transected left subclavian artery was now flapped down onto the hypoplastic transverse arch up into the proximal opened left carotid artery as a reverse subclavian flap repair using 7–0 polypropylene suture. The clamps were released with the left carotid occlusion time of 21 min. The ductus arteriosus was now ligated, and descending aorta was snared again. A C-clamp was now applied over the aortic arch occluding the left carotid artery till the innominate base. The cranial perfusion was monitored. The descending aorta was divided distal to the ductal tissue and all the remaining ductal tissues were removed. The undersurface of the aortic arch was now opened across the inferior aspect of the coarctation segment well into the proximal aortic arch. A small cut was made on the lateral aspect of the divided descending aorta, and an extended end-to-end anastomosis was completed using 7–0 polypropylene suture between the undersurface of the newly enlarged transverse aorta and the descending thoracic aorta [Figure 2]. The anastomosis was completed with a clamp time of 23 min. 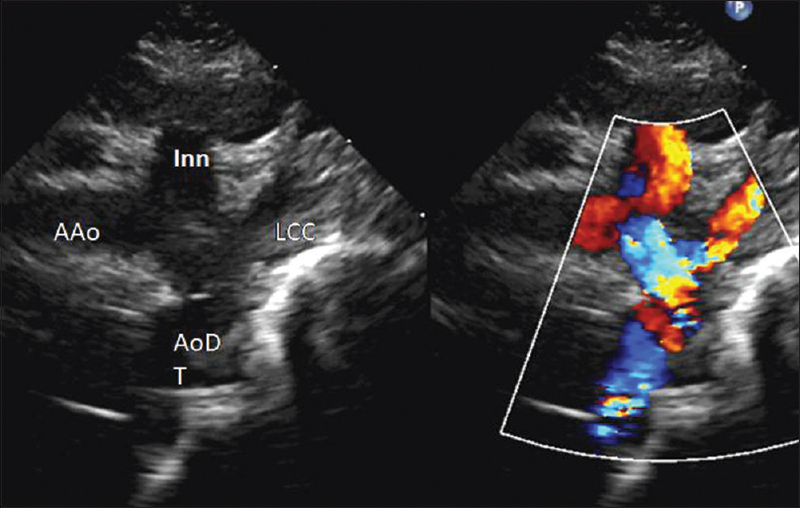 The child had an uneventful recovery with echocardiogram done at 1-year follow-up showing a fully opened up aortic arch without any significant gradient [Figure 3]. A true presubclavian coarctation of the aorta with aortic arch hypoplasia is a technical challenge. There is reasonable evidence that hypoplastic aortic arch should be addressed and is an independent risk factor for early mortality after coarctation of aorta repair.,, Standard coarctation of aorta repair has often resulted in augmentation of the aortic arch during the same operation or during a second operation later. Further evidence that the hypoplastic aortic arch often does not grow after a pure coarctation of aorta repair is strengthened by the autopsy finding of fewer alpha-actin-positive cells in such cases that could indicate a diminished growth potential. Moreover, any residual arch gradient will be poorly tolerated in a child with borderline left ventricle as was seen in our case. Once decided for simultaneous arch repair, few surgical options are available. Repair through a median sternotomy would require the usage of cardiopulmonary bypass with severe hypothermic cooling and selective cerebral perfusion and its associated morbidity and time for recovery. People have often used pericardial or polytetrafluoroethylene patches to repair presubclavian coarctation with arch hypoplasia with higher risks of recurrent stenosis. Another option would be to do a very extensive anastomosis of the descending aorta to undersurface of the proximal aortic arch and anastomose left subclavian to the left carotid artery. This option requires resection of the coarctation segment in the distal arch while making the final anastomosis. With the patient having a narrow isthmus and large ductus with ductal tissue extension into the aorta requiring removal of all these tissues, we thought that the final anastomosis would be very challenging in the time frame available if we further remove the tissue from distal arch. Another technique employed that the reverse subclavian flap aortoplasty was received as a good surgical option in such cases. In our case, we have employed a reverse subclavian flap aortoplasty with extended end-to-end anastomosis to address presubclavian coarctation of the aorta with distal arch hypoplasia and borderline proximal aortic arch. The coarctation segment of aorta situated between the left carotid and left subclavian artery is cut in both superior and inferior aspect and augmented with native aortic tissue, hence theoretically decreasing the chance for recurrence. Moreover, by extending the end-to-end anastomosis toward the proximal aortic arch, the arch hypoplasia is dealt fully. While using this technique, one must extend the reverse subclavian flap onto the proximal left carotid artery to address the distal aortic arch hypoplasia. Moreover, by dividing the left subclavian artery, the extended end-to-end anastomosis can done more proximally toward the innominate artery base, since the tension on the anastomosis by the pull of the left subclavian artery is negated. The first part of the operation is done by perfusing the lower half of the body through the patent ductus arteriosus, thus protecting the spinal cord and viscera by reducing the ischemic time. We have employed a modified technique to deal with presubclavian coarctation of the aorta with arch hypoplasia which reduces morbidity and allows fast recovery with theoretically less chance for restenosis. Allen RG, Maria-Garcia J, Nayek G. Methods of management and results following surgery for coarctation of the aorta in infancy. J Pediatr Surg 1980;15:953-60. Kubota H, Camilleri L, Legault B, Miguel B, El Youssoufi AT, Bailly P, et al. 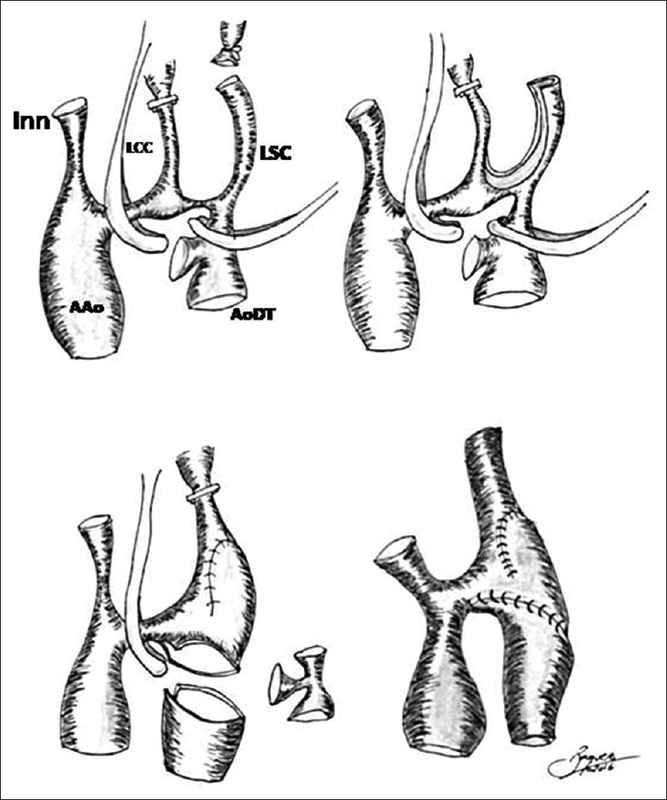 Surgical correction of the hypoplastic aortic arch by the subclavian free flap method in the neonate. J Thorac Cardiovasc Surg 1998;116:519-21. Kanter KR, Vincent RN, Fyfe DA. Reverse subclavian flap repair of hypoplastic transverse aorta in infancy. Ann Thorac Surg 2001;71:1530-6. Herrmann VM, Laks H, Fagan L, Terschluse D, Willman VL. Repair of aortic coarctation in the first year of life. Ann Thorac Surg 1978;25:57-63. Baudet E, al-Qudah A. Late results of the subclavian flap repair of coarctation in infancy. J Cardiovasc Surg (Torino) 1989;30:445-9. Machii M, Becker AE. Hypoplastic aortic arch morphology pertinent to growth after surgical correction of aortic coarctation. Ann Thorac Surg 1997;64:516-20.